anker CHOETECH Degauss Labs Gadget bag HOWL 3 Keyboard lenovo logitech MH30 Nonda sony Tech bag Thinkpad tylt wall charger xperia z2 ZUS What's your tech bag looking like these days? What's your tech bag looking like these days? Whether it's for school, work, leisure we all carry a backpack at one point or another. We carry any number of items from books to laptop and gadgets. I tend to revisit my backpack and what I carry often as my tech gear changes often enough that it's warranted. There's been a number of "tech bag" or "what's in my bag" done over the course of the year and I've decided to follow-up with an update on mine. As much as I'd like to have "top of the line" gear all the time, I need to make due with what I have. This comes down to a choice of gear and I'm no exception to that rules as I do have specific brands I like to keep around. You'll find all the relevant link to each product (if available) at the bottom of this article. Let's start by providing you with an overview of the gear that I have in my TYLT Energi Pro Power Backpack, which was recently featured in a review I completed. The Logitech TYPE-S Bluetooth keyboard folio is my go to when I pair it with the Sony Xperia Z2 Tablet. On the obvious side of things, this isn't the folio for the Z2 Tablet, but it offers a surprisingly well-incorporated stand that it can rest on, making it a breeze to use. While I like to use the touch aspect of my tablet, I cannot go without a mouse if I on being productive. This allows me to set myself up anywhere and be mobile. In keeping with the mobile trend. This is where my famous Lenovo mouse comes into play. I need 2 OTG cable that supports both MicroUSB and Type-C. As much as I'd like to forget USB-Flash drive, this is a very convenient way to access some of the information clients and partners are sending to me. I'm still surprised that with today's choice in terms of data sharing methods, that many would rely solely on a USB stick. There's another item that makes use of MicroUSB, Type-C and USB-A on the above, it's my SDcard & MicroSD card reader. Often enough, I may need to get images from the camera and copy them over to the tablet to work with them and this was a very cheap way of doing it. Over the past few months, I've touched on a few high-quality audio items and I would part without them. For the times that I'm on the subway, train, car or simply walking, I tend to rely on Degauss Labs HOWL 3 for my music indulgence. When I'm in a stationary mode, I'll usually opt for something like the MH30 from Master and Dynamic. It brings new life to music from any genre. 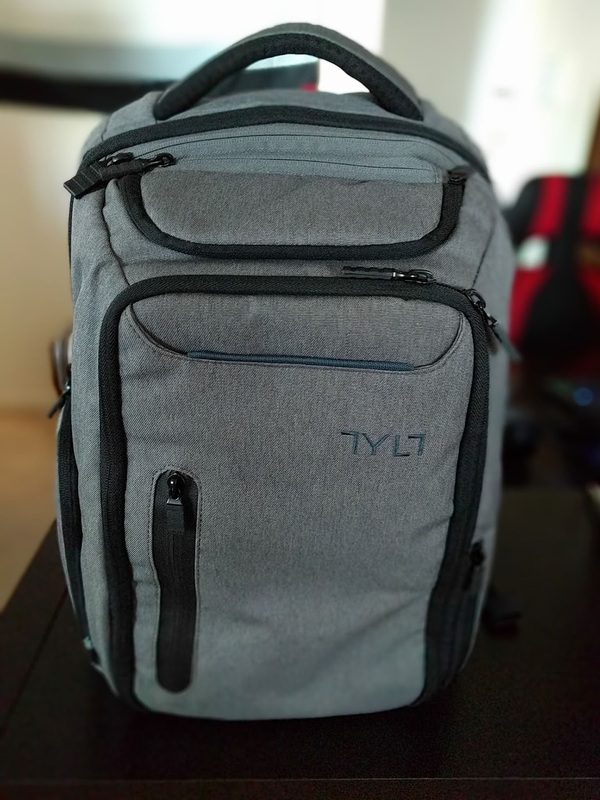 The large TYLT battery is part of the Energi Pro Power Backpack which holds an impressive 20100mAh of power that can be distributed among a Type C port and 2 USB-A which support Quick Charge 3.0 technology. What more can you ask when this is pre-built into your backpack? If I happen to have a need to part with my trusty backpack, I can always count on the 3200mAh pocket stick that TYLT provides with the TYLT Desktop Charging Station, generally speaking, this is more than enough to give me a full charge back to my smartphone which will allow me to extend myself quite a bit over the period of more than a day. What you don't see in the picture and that's something that I also forgot to include was NONDA's ZUS cable USB-A to Type-C that I use with the smaller portable battery that I have. Then how could I leave aside my sidekick in the hotel room or coffee shop? CHOETECH 39W 3-Port Wall Charger which will provide me with my USB-C connection as well as 2 extra USB-A port that can both deliver optimum charging rate due to the smart tech built into it. To compliment the setup, I have a CHOETECH USB-C to USB-C cable and 2-durable cable for MicroUSB connection. This should suffice to power all my gadgets wherever I may end up! However, you may find other brands that do provide this support. When it comes to USB-C tables and USB-C to USB-A that really depends on the buyer's preference. A lot of the newer cables when it comes to Type C needs to specifically say that a 56kOhm resistor is in place to guarantee safe usage. As well you'll notice that some may display the USB-C certification information as well. This is it for my current "Tech Bag" if you have questions, comments, please let me know! I'll be more than happy to chat you up! You can also find me on my own site @ www.cryovex.com.